The Abbott Government's commitment to a neo-liberal mode of governance is now clear. In this mode of governance civil society is a market, and the role of the government is to keep the market running by removing as many market distortions as politically possible--to get the economic fundamentals right ---and to let the market sort things out. The government gets out of the way and the market produces the right outcomes with respect to prosperity,” “growth,” and “development. One of the market outcomes it to lower wages--- most of those unemployed by the destruction wrought by the dynamics of the global market on Australian companies--eg., manufacturing, airlines--- will eventually find work with lower wages and worse conditions. Neo-liberal governance aims at transforming recipients of welfare and social insurance into entrepreneurial subjects, who may be motivated to become responsible for themselves--get them off welfare and into the workforce. Of course, the Abbott Government's commitment to a neo-liberal mode of governance is not pure since the market does need the support of the state to be laissez-faire: autonomous and self-sustaining. Secondly, neo-liberal subjects are more than just economic subjects and the economic order tends to operate in connection with many others: for example, through uses of multimedia and digital technologies, life active participation in consumption, and engagement in conducting life as an enterprise. Thirdly, the Abbott Government coercive and authoritarian tendencies indicates dealing with a state of exception due to national insecurity (the suspension of the juridical order by law), by repressing organizations, activities, and individuals that fall into its definition of political enemy. In short, its a reactionary government. 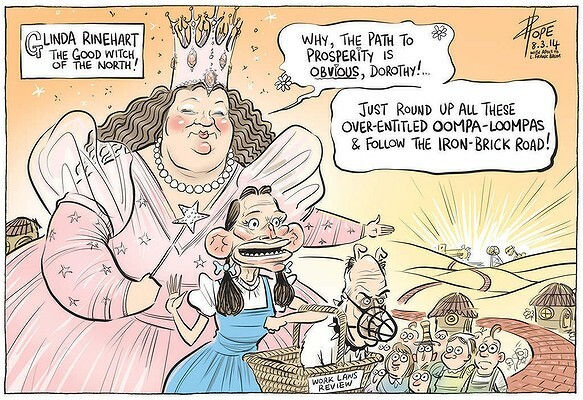 The cartoonist has been finding their range with Abbott and co's insanity, this is the best yet, because that exactly what they are- deluded, vindictive opportunist animals.